November 25, 2014 — We at ICFC were deeply saddened by the news of Allan Baker's death on 20 November 2014 at the age of 71. Allan was Senior Curator of Ornithology and head of the Department of Natural History at the Royal Ontario Museum. He was a Fellow of the American Ornithologists' Union, an Affiliate Member of the Allan Wilson Centre for Molecular Ecology and Evolution in Massey University in New Zealand, an Associate Editor of Systematic Biology and a member of the Editorial Board of BMC Evolutionary Biology. He also co-chaired the All Birds Barcoding Initiative (ABBI) steering committee, which aims to identify all the >10,000 species of birds in the world. Through his career, Allan published over 160 papers in scientific journals, and edited a book on molecular ecology. In 2007, the American Ornithologists' Union presented Allan with the William Brewster Memorial Award for his outstanding and influential work in avian molecular evolution. 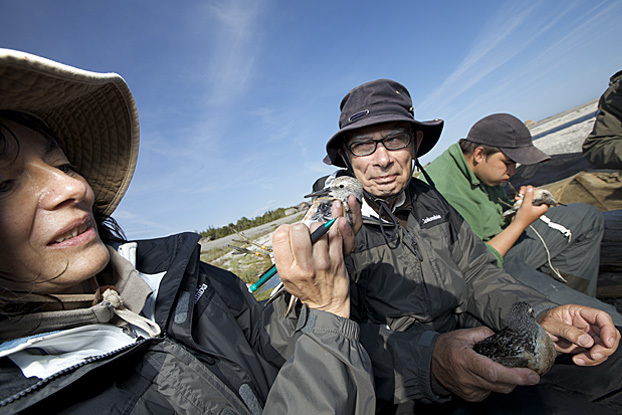 Apart from studying how biodiversity has evolved, Allan also was heavily involved in the conservation of migratory shorebirds. Along with Professor Theunis Piersma of the University of Groningen in the Netherlands, he was co-founder of the Global Flyway Network of collaborative researchers to provide an early warning service for identifying migratory shorebirds at risk. Recently Allan had started working with ICFC to develop our new Shorebird Conservation Initiative in Latin America. He will be greatly missed, personally and professionally. A celebration of Allan's life was held on December 2nd at the ROM.